Get both Secret Betrayal and The Dream of the Fathers for an amazingly low price. This thrilling offer will not last long, and you will miss out on the best opportunity to get both of these riveting novels at this great price. Both novels are full of political history, romance, and startling visions of our past and future. 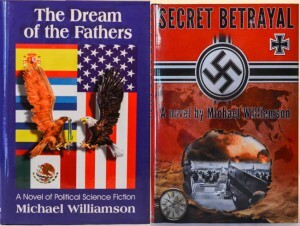 Witness Williamson’s vision for the future of the United States in The Dream of the Fathers and the redemptive power of love against the horrors of war and fascism in Secret Betrayal! Purchase both EBook novels together, both in the same format for only $5.00 when available. Coming in 30 Days. For only 35.00, plus $10.00 flat shipping rate, you can have both Secret Betrayal and The Dream of the Fathers in hard cover! Don’t miss this exceptional offer. Win up to 15 copies. Purchase The Dream of the Fathers or Secret Betrayal and you will be entered into a drawing for a full refund of the purchase price. We will conduct a drawing on the last day of each month. You will compete only against others who have purchased in that month. The lucky winner will be sent a check for a refund.